Whether you use Skype to stay in contact with your friends or for business purpose, recording and storing your calls can be very helpful for later reference. Download and install this Skype Call Recorder for Win and start recording your Skype calls from today. 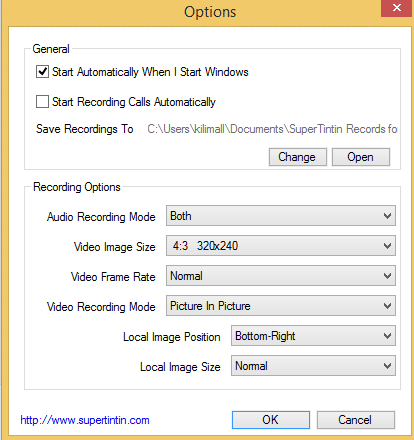 Supertintin is the best Windows software that records both audio and video Skype conversation and gives you the option to store the recorded files for future use. This application is a lightweight Windows application with good design to make your Skype calls worth. Supertintin has a clean and pleasing layout that displays details of active streams available on Skype. With this software, you can play or even stop recording sessions anytime you feel like. After recording your files, you can save them on your favorite folder where you can access them easily for reference. The application is compatible with all Windows devices without much complications. For the starters, it is an easy to use application, and you will not have a hard time when recording your Skype calls. It is the right time to have a different experience in your Skype conversation through the use of this application. 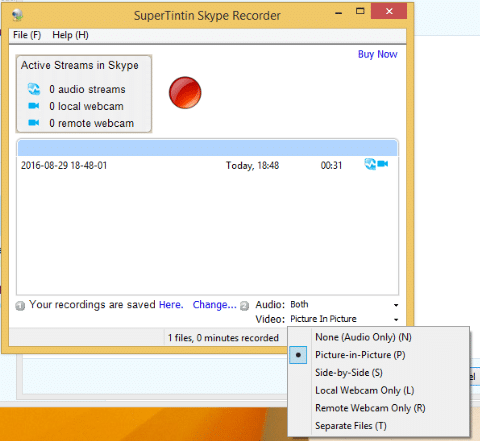 Even though Supertintin Skype Recorder is not perfect like TalkHelper software, kit is one of the best recording tool in the market. The impressive features amazes everyone in the tech world. Supertintin is easy to install and only takes few minutes. No one will ask you the serial number, everything is direct to the point. Check out this guide for a smooth running of both your Skype and recording software. After you have downloaded Supertintin, the display is straight forward with all local webcams, remote webcams and audio streams listed on the display. Also, your recordings are on the first display of this tool. Just below the big red button, all your recordings are listed and if at any case you click on one, it will play or direct you to the video directory. You can configure them to your folder of choice. This tool is simple to use since it does not offer many features. The red button is for recording and also acts as the “Stop” button. Once you place your call on Skype, you can then click “Record” and you are good to go. You can choose the type of picture recording you want by clicking on the options beneath the software interface. Click “Video” and choose your preferred option. On the same settings, you can choose your preferred audio recording you feel fit for your kind of service. For additional settings, Click “Help” then “Options”. You can then set your tool as you wish. A smooth working software will give you the best service ever. You can go to the “Options” and set the software for great convenience. At the right hand corner you will find a button that can allow you do your audio and video settings. When you select a particular audio, you can save for both the sender and the receiver. Additionally, the video allows you to save in side-by-side, local webcam only, remote webcam only, picture- in picture, and also saves the video files separately. The Option button gives more settings to help you configure video size and frame rate. Mostly, this tool records at the lowest setting always. There is nothing to hate about this software. First it is easy to install, secondly, it works excellently and flawlessly. 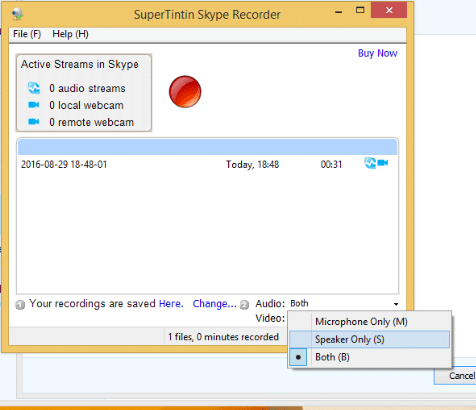 Record your Skype calls and videos with Supertintin Video Recorder and enjoy great recordings for future reference. It may not give everything like TalkHelper Skype Recorder, but at least it will offer the basics as far as Skype recording is concerned. The 5 minutes of recording is enough for all your short recordings. Picture to picture and side to side-video recording: With this application it possible to record picture in picture while making Skype video call. The program can be hidden during Skype call recording sessions. The application is lightweight. 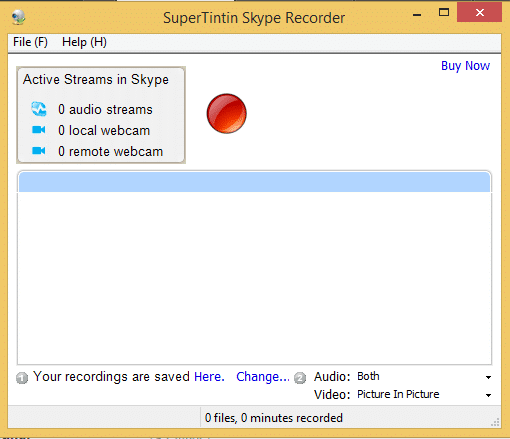 Supertintin Skype Recorder is small size software and occupies less space on your computer. The other amazing feature of the application is the ability to select video size and frame rate. Trial version only records for 5 minutes. The company offers a test video call but ignores the request to use it. If you wish to record conversations in video formats, you must have to check for the option. 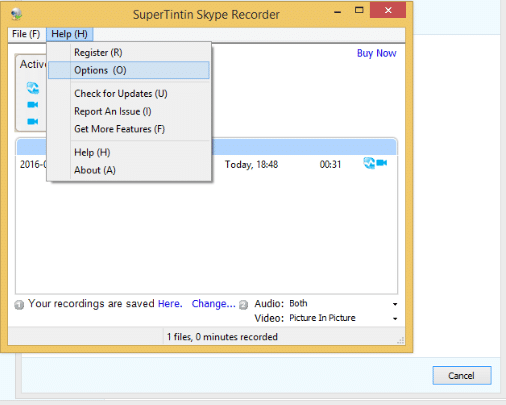 All in all, Supertintin Skype Recorder is a nice software and easy to use when recording your Skype Calls. The features are impressive but slightly different from TalkHelper Software although they all serve the same purpose. You need to have this Skype Recorder for a different experience whether for personal or commercial use. The application is compatible with all window users without limitations. @2019 TalkHelper.com. All rights reserved.